Printer-friendlyComments (1)Cambodia averages less than 1 computer per 100 people, compared to 80.6 per 100 people in the United States, according to statistics from the World Bank. Todd Alexander, in the center back row, poses with Justin LaVigne, at right, in the first Prek Koy School photo with students and staff. 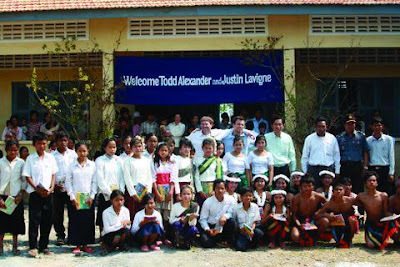 Todd Alexander and Justin LaVigne, second and third from left in back, on a visit in 2009 with some of the families in the Siem Reap area who are now sponsored by Family to Family Cambodia. Todd Alexander cuts a ceremonial sash to open the Prek Koy School in Cambodia in 2009. 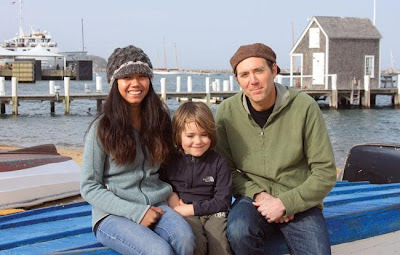 Roma Chhon, who inspired the Vineyard connection, with Todd Alexander and his son Sebastian, 5, overlooking Vineyard Haven Harbor. Todd Alexander of Oak Bluffs plans to change those numbers, a few boxes at a time. 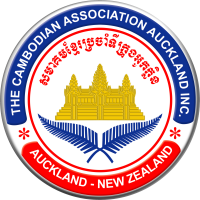 On March 22 the Oak Bluffs harbormaster will take time off to travel to Cambodia to visit three schools he helped build in the southeast Asian country. Instead of taking extra luggage filled with clothes, however, Mr. Alexander plans to take at least five boxes of used donated computers he collected. He calculates the fees charged for excess baggage will be a small price to pay to hand-deliver modern technology to teachers and students who need it. Mr. Alexander, harbormaster since 1993, became involved about six years ago in the Rural Schools Project run by American Assistance for Cambodia (AAfC), a non-profit organization. Founded by American journalist Bernie Krisher in 1999, AAfC built 502 schools to date in rural Cambodia with funds raised by organizations and individuals like Mr. Alexander, matched with donations from the World Bank and Asian Development Bank. A 14-year old Cambodian girl, Roma Chhon, inspired Mr. Alexander's involvement. He and his wife, Kara Gelinas, met Roma when she was selling postcards and books to tourists outside a Cambodian temple in 2004. When they found out she had dropped out of school to work and help support her family, they offered to pay her educational expenses and did so for the next three years. 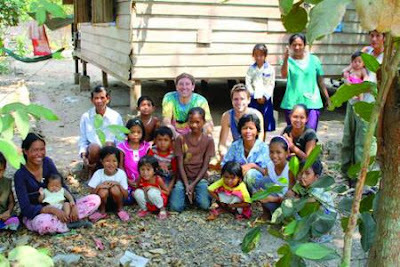 The couple's support for Roma led to their efforts to help build schools in Cambodia. After Mr. Alexander learned about the Rural Schools Project, he fulfilled his goal to raise enough money, at that time $13,000, to build a new school that opened in Siem Reap in 2005. He and his wife named it the Vineyard School, in honor of generous family members, friends, seasonal and full-time Island residents, and visitors whose donations and participation in fundraisers made it possible. Buoyed by the success of his fundraising efforts in just six months' time, Mr. Alexander didn't stop there. He and Justin LaVigne, a friend in Edgartown, raised enough funds to build the Prek Koy School in 2009, named after a nearby river. 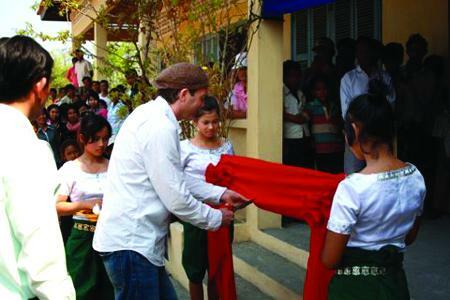 A third school, the O Meah School, opened in Stung Treng on March 5. Mr. Alexander has already raised 85 percent of the funds required to build a fourth school. He has an ambitious schedule for his upcoming trip. This time around, Mr. Alexander and a friend skilled in computer use, Max Ferro, will deliver 20 used laptop and 2 desktop computers in visits to the three schools. The donated computers were more than Mr. Alexander expected to receive when he put a notice asking for them on Facebook and emailed past donors. As a result, he could pick and choose the best and use others for parts. Mr. Alexander plans to continue to collect old computers and share them with Project Enlighten, a non-profit organization based in Arizona that provides education and humanitarian assistance, with a focus on south east Asia. Mr. Alexander invested in a software program to wipe unneeded programs and personal data from the computers. Since the students don't have Internet access, all they need is a Word program, he said. "Two of the schools are nowhere near power, so I thought, what's the solution? A laptop with a battery," Mr. Alexander said. "One of the schools has one desktop computer running off one solar panel, which is tied into two car batteries and a small inverter. And that's for 150 kids to learn how to use a computer." With one computer for five classrooms, the teacher that uses it said it does not last a day. "So he's teaching them about computers on a chalkboard," Mr. Alexander said. In addition to computer deliveries, his trip has another purpose. Mr. Alexander said once the schools were built, he realized it would take more than a building to get some students to attend. For many Cambodian families, school continues to be a luxury that they can't afford. It's not just a matter of the cost of uniforms and small monthly school fees, but also family income. If children go to school, they can't work. With that in mind, Mr. Alexander recently began channeling his energies into the start-up of Family to Family Cambodia (FTFC), an organization that matches up Island families with Cambodian families to provide financial support for their children's education. FTFC is currently undergoing the Internal Revenue Service process to achieve non-profit status. As an example of some of the families sponsored by the program, Mr. Alexander described one that includes a fisherman whose leg was blown off by a landmine. "So he had his kids, two of them, maybe 6 and 9, and they would help him fish," Mr. Alexander said. "Why doesn't he have an artificial leg? They can't afford one. So there's one kid holding him up, helping his father stand while he throws a net, and the other one helping him haul it in. They're not going to school. To make it simple, it's go to school or eat." Currently about 10 families, including 6 on the Island, participate in FTFC. Their average donation is about $50 to $75 a month, Mr. Alexander said. That provides for school and transportation costs for two to three students per family, plus a little extra to cover the loss of the children's income and pay for food. More information is available on the website familytofamilycambodia.com. Mr. Alexander will also visit Roma's family. Roma, now 21 and living on the Vineyard, visited the Alexanders and their son Sebastian for three months in the summer of 2006. After she returned to Cambodia, she applied for and received another visa to return to the Island in 2009. Roma plans to work with a tutor this summer to get her high school equivalency credential. Her longer-term goal is to get more education and return to Cambodia to work in her village as a teacher. As one last fundraiser for FTFC before he leaves, Mr. Alexander will host a round-robin tennis tournament at the Vineyard Tennis Center tomorrow, March 18, from 5 to 8 pm. It costs $25 to participate and donations are welcome. On April 14, four days after he returns home, Mr. Alexander, his wife, and Roma will attend a Friends Without a Border gala benefit in New York City in honor of Mr. Krisher. Proceeds go to Angkor Hospital for Children, located near Roma's home. "I'm so honored to be invited, since two of the people that inspired me to start my own nonprofit organization will be there, Bernie and Nicholas Kristof of the New York Times," Mr. Alexander said. To arrange to donate computers to FTFC, call 1-888-773-1413 or email Mr. Alexander at alexsail508@gmail.com . Computers and donations may also be sent to P.O. Box 2225, Oak Bluffs 02557. It's amazing to pay a quick visit this web page and reading the views of all colleagues on the topic of this paragraph, while I am also eager of getting experience. anything totally, however this article presents good understanding even.